Movetocambodia.com was created to help new expats settle in to the Kingdom of Wonder. 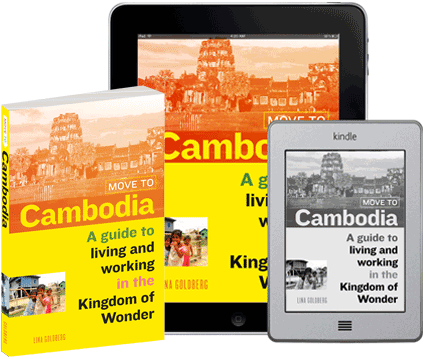 The book and site offer information about the country, plus practical advice to help plan your move, find a job, and handle the challenges of day-to-day living in Cambodia. The Move to Cambodia team hard at work. The book and site were written by Lina Goldberg, an American writer who moved to Cambodia in 2010 and is usually based in Siem Reap. She’s written about Cambodia for publications including including CNN, Lonely Planet, VICE, Wall Street Journal, South China Morning Post, and BBC Travel. You can read more of her work at linagoldberg.com. The blog is written mostly by Lina, but also a team of expat writers based around the country who keep the information on the site up to date. Currently, that’s Pete in Phnom Penh, Zanny in Siem Reap, and Sydney in Kampot and beyond. The design comes from Durable Goods, aka Frances Duncan and Dan O. Williams. They specialize in the planning, art direction, and design of websites, books, and ebooks. Frances’ favorite memories of Cambodia include peppercorns, iced coffees, talking with two little kids next to a tuk tuk beside an ancient temple, power lines, “lady you buy something,” hot wind, cold beer, and pork and rice. If you like Move to Cambodia, check out our Move to Cambodia blog is filled with up-to-date travel advice and useful information for expats. 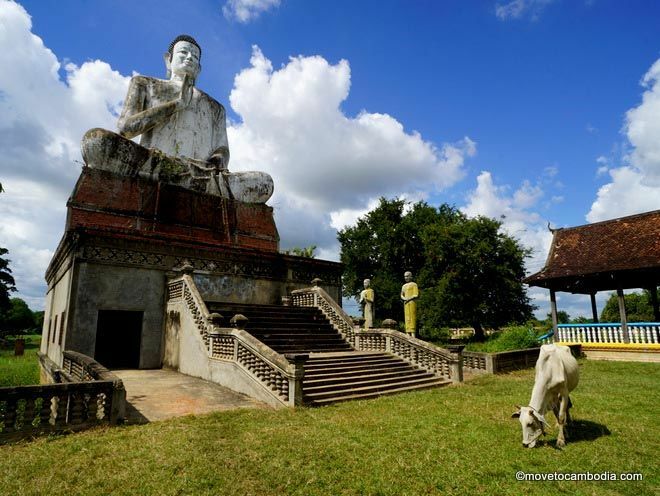 Move to Cambodia accepts direct advertising and third-party advertising through Google. We do not accept paid links. We mark all links relating to advertising “nofollow” per Google’s policies. We are affiliates for a few companies, and try to disclose this fact when we link to them. The companies we are affiliates for are: Agoda, Booking.com, Hostelworld, BookMeBus, 12go, Amazon, and World Nomads. We are also customers of these brands! We do not offer editorial content or reviews in exchange for freebies. Most guidebooks are written by writers who do not stay in the hotels that they review. They view a room for five minutes, leave, and write 10 to 20 hotel reviews in a single day. Whenever possible, we stay in the hotels we review. However, this means that we sometimes accept freebies or take advantage of media rates, because a site as small as Move to Cambodia can’t afford some of the higher-end places that we’d like to review. On the very rare occasion that we do accept a freebie, we disclose it. We understand that trust is important, and we really only give positive reviews to places and companies that we think are great. Generally, we don’t bother including places that are sub-par in our guides anyway, but if we got a freebie and the place was terrible, we wouldn’t give them a phony positive review. We understand that the lines can get blurred because we often ask our favorite companies if they would like to advertise on Move to Cambodia, which then means we have reviews or content related to our advertisers on the site. If you have any questions about our policies about advertising, freebies, or partner companies, please feel free to drop us a line.